Only 8 students in class at Noguchi sensei’s class but still, he was brilliant! The small number of participants didn’t stop his endless energy. We covered the first level of Gyokko Ryû (again). In my sixty trips here in Japan, I must have seen these techniques at least thirty times. And this is always a pleasure, as his interpretation of these known waza is always different. In fact, what Noguchi sensei does with the techniques is so far from the basic form, that it could be another fighting system. Because there were so few students, I trained with a young Shōdan. He was totally lost because he’s didn’t know the basic waza from the Gyokko Ryû. 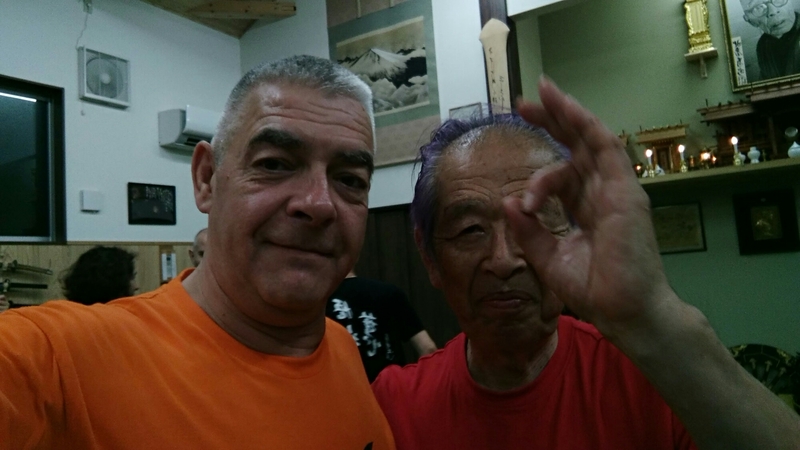 Even though I think that anyone should come here to train with Sōke and the Shihan, if you don’t know your basic forms, maybe it would be better to not come to Japan! I wrote recently an article about the responsibility of being a black belt. As a teacher you have a bigger responsibility. Maybe because of the stress added to his lack of knowledge, my partner was only using upper body strength, and was unable to move his legs. I don’t blame him, I blame his teacher. How can you create black belts with an apparent lack of basics? I was losing my time and began to be irritated (this is an understatement). I asked him why his level was so bad? He answered: “we do only basics”. If it were true, he would have been good enough to train with, but that wasn’t the case. He didn’t know the Bujinkan basics at all. I don’t blame him, but his teacher. know that his teacher is Jûgodan, but I don’t know who he trained with, but he has to reconsider his teaching abilities. He let him go to Japan without the fundamental keys to survive here. If this young black belt had trained with another young black belt, I guess things would have been OK. But with me, he had a hard time, and the more the class was going, the more he was lost. I don’t mind teaching beginners, this is my main activity in my dōjō, but when I come here, I come exclusively to train, not to teach. As I had to teach him, I missed a fantastic class by Noguchi sensei because his teacher didn’t do his job correctly. I hope that one day I can meet his teacher, and tell him that what he does has to change. I’m aware that he might not even be responsible himself, maybe he too, had a bad teacher. To teach, you must be focused on the quality of the transmission. Having a black belt rank doesn’t mean you are qualified to teach. Teaching is an ability you learn or develop. There’s no improvisation in teaching. It is important to be aware of your teaching skills, if you don’t have any, the best is to stop teaching. 4. Not every black belt is able to teach. As a teacher you are responsible for what you give. The world is not nice. Teach the right thing. Because the lives of your students might depend one day on the quality of your teaching and of your transmission. Hatsumi Sensei repeated in his last class, that he is only teaching the Jûgodan. He added that teachers have to teach the basics to their students. Without good basics, there cannot be any good transmission. I have sometimes the feeling that Bujinkan teachers are actors. They are keen in showing the “cosmic flow” (that they often don’t have) than to teach the foundation of taijutsu. Renember that what you see here in Japan, is not what you have to teach. What you see here, is your next personal goal, your potential future. So, please, teach your students correctly! As a teacher your responsibility is to teach the bio-mechanics of Budō, not the “cosmic flow”, it is useless, and only a show of ego. Your only job is to teach the roots of correct taijutsu. Next Post You’re Ninja? Good! I’m Santa Claus. I have had a few classes like that in Japan. It can be really frustrating having to almost teach basics when they should already know them, instead of just training. I have one of my students out there now, hopefully I have taught him OK and he is doing alright. Querido hermano Arnaud. Has dicho tantas VERDADES en tan poco escrito que me quito el sombrero. Estoy HARTO de ver y hablar sobre esto, pero no es culpa del practicante, como de costumbre hay que mirar “más arriba”. Y normalmente el defento ahí será la falta de responsabilidad y preocupación por una correcta enseñanza. Y totalmente de acuerdo en: “… si practicases lo “básico” tu budo no sería tan malo…” Chapeau!! *Sorry for don’t write in English! Great read ! Thanks for sharing 🙂 Kihon is the biggest missing link Bujinkan students have these days. The mindset is fixed on acceleration of rank not working hard to develop a strong base, thus the outcome is weak ! Simon Gaunt. Bujinkan Hiryu Dojo. Correct me if I’m wrong but don’t the Japanese shihans including the soke share the responsibility for a great number of teachers who do not know the basics of the system? I had a teacher in Serbia who after almost 3 years of teaching never taught me basics so I quit. But soke gave him 14th dan (i think he is 14th now, maybe even 15th). I know for a fact that this man is not even trying to learn the basics, he’s just teaching his own stuff. Also many popular jugodans give out Dan’s as presents… I have never liked this and will never like it. This is the reason I stopped grading up. Youtube is full of people who are legitimate jugodans (well they were given the grade) who wouldn’t survive 90 seconds with me in a fight. Even if they were prepared for it. And i’m not a black belt in any art. So I ask you as a Bujinkan representative and soke’s student, why this happens? What good comes out of it and why does soke do it? Please share whatever you have on your mind, I’m interested. To me, it just looks like soke does not want to be bothered so he gives everybody what they want. Hi Milan, the situation was more an excuse to write about “how to teach and what to teach your students” than a rant on this young shōdan. Like many others, I I have often wondered why the Japanese fan so much the flames of the Westerners ego by giving away Dan ranks like candies. It is like spoiling a child who becomes rotten, falsely imbued of his/her own worth and unfortunately taking others down with him/her. But never have I read the answer to that question. Has any of you high ranking people who regularly speak to Hatsumi raised that with him or any of the Japanese Shihans? It would be interesting to know their response. My wild theory is that, as well as being a test to the ego of a person, it is to hide the true potential of this martial art in the middle of the dross. In a way, being a “real ninja”, passing for a fool in the eyes of all around (other martial artists) in order to deceive and let your enemy relax. Hoping that people with the right heart will find a way, will have the ‘karma’ to wiggle their way through, finding the right teacher for them, and continue training, continue learning and developing. But how many right hearted people will have been turned away, frustrated, disillusioned, depressed, disgusted, so sick of the incompetence passed down generations (into them as well), the politics, the empire building, the money grabbing, the corruption, in short, the whole state of affairs? Often, I wish that there would be no rank, everyone wearing a white belt, no badges, no stars to indicate a level. No Jugodan or black belt t-shirt either, nor a “warrior name” embroidered on a belt. I’m not sure how many people would be able to stand that… Very hard on the ego which needs to be recognised, acknowledged by others at all time; and ranks are feeding that disease of the human mind. I’m sure some would still find a way to differentiate themselves, maybe artificially making their white belt look grubby and or worn to show they have trained a long time. All the “stars” could only count on how well known their face is to receive the admiration and respect they think they are due. But on the main, everyone would have to judge others competence on the way they move, not on whatever colour their belt is or the number of stars on their chests. Some scales would fall from people’s eyes then! This sounds more like a gripe session than an informative blog about teachings from Japan. All ranks are welcome to train in Japan. Some budoka are better than others. That’s truth. I feel it’s naive and immature, especially from someone of your stature, to whine about training with a shodan well below your own skill level. It happens. Soke base said that he often learns much from white belts. Rank doesn’t matter. Training attitude matters. If you can’t gain anything from Noguchi Sensei’s teaching because of “your partner’s lack of ability”, then that’s your shortcoming, not your training partner’s. You’ve been to Japan 60 times. I’ve been twice, and I know this. I had a teacher who after almost 3 years of teaching never taught me the basics so I quit. But soke gave him 14th dan (i think he is 14th now, maybe even 15th). I know for a fact that this man is not even trying to learn the basics, he’s just teaching his own stuff. To give an example of the BS, I was said that nage wasa is not practical and so it was avoided altogether in classes. Furthermore many popular jugodans give out Dan’s as presents… I have never liked this and will never like it. There are a lot of legitimate jugodans (well they were given the grade at least) who wouldn’t survive 90 seconds with me in a fight. Even if they were prepared for it. And i’m not a black belt in any art. So I ask you as a Bujinkan representative and soke’s student, why this happens? What good comes out of it and why does soke do it? Please share whatever you have on your mind, I’m interested. To me, it just looks like soke does not want to be bothered so he gives everybody what they want. Hi Anraud! Thank you for your reply. Sure thing, I agree, ranting misses the point, but I come from a country where teachers teach for more than 20 years now and I find myself knowing more about basics than most of them (i am interested so I researched). These ppl are near jugodan and they produce black belts who know even less… They even encourage them to open their own dojos, so that they can earn more money via seminars etc. I think you can imagine the repercussions of this scenario over time. I am just interested why there isn’t any form of control as all these people have Hatsumi singed diplomas. This might be “dirty laundary” sort of question but I do not care. I am the one who was taught BS and know I have to unlearn the mistakes and put much more, otherwise unnecessary effort into my training. I do not quit and will not. I do not care about grades and belts. But this is real problem and I care, believe it or not, about Bujinkan and about sensei’s teaching even if I haven’t met him in flesh. So please, if you can, answer my question or rather give an advice on what can be done.